As we crested the summit, a gust of wind brushed away a thick tangle of clouds and our eyes fell upon a spectacular sight: Mount Merapi, Indonesia’s most active volcano. 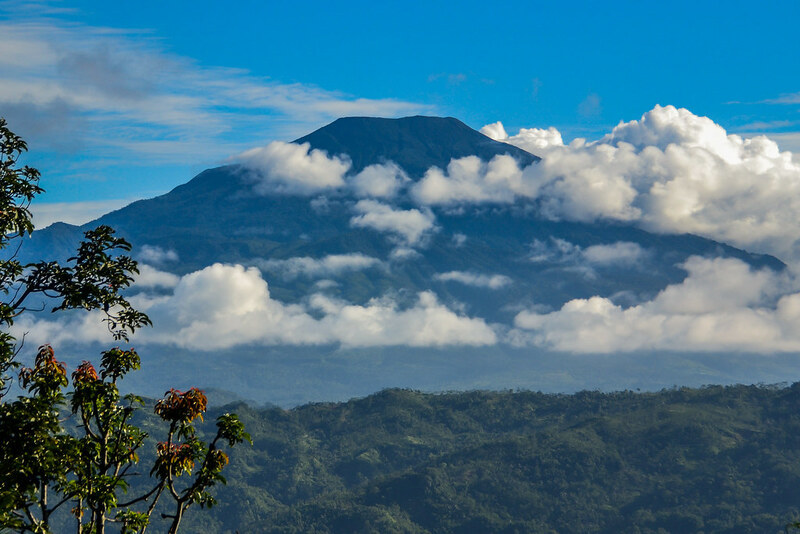 Rising almost 3,000 meters (10,000 feet), “Fire Mountain” has been regularly erupting since 1548. The last major explosion goes back to 2010. 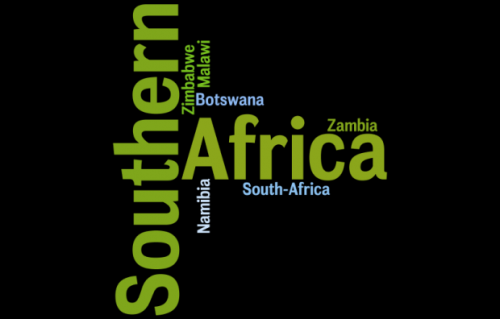 Over 300 people lost their lives and thousands of locals fled their homes. 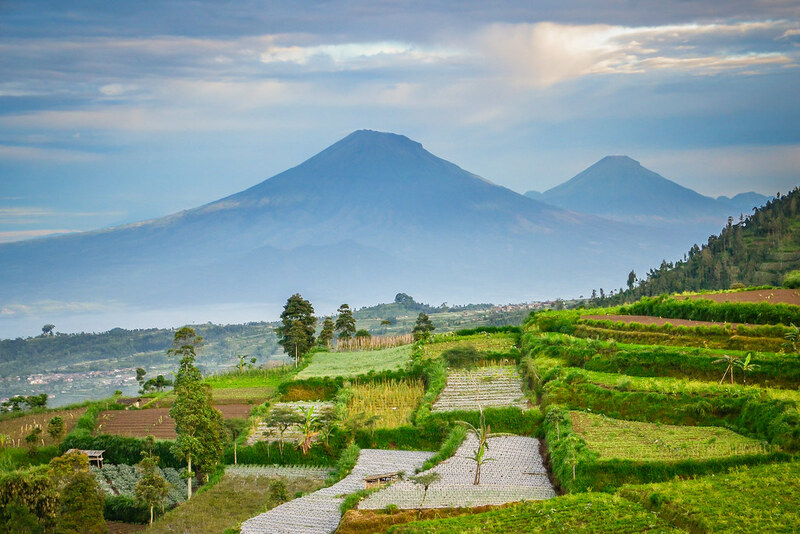 Despite Merapi’s daily rumblings the menacing plumes of smoke drifting over the peak, the fertile land is blanketed in terraced rice fields and symmetrical garden plots. Rambling villages speckle the mountain’s slopes. It’s a danger zone, not doubt. Fortunately, when we passed, Fire Mountain was at rest. Mother Nature humbled us without a lethal spraying of volcanic rock and ash. That’s Merapi in the background. If you look closely, you see the villages scattered over the base of the volcano. Locals are courting risk, but the soil is so fertile it entices them on to the slopes of the sleeping giant. The land is heavily cultivated and produces vegetables and rice for those living at lower altitudes. 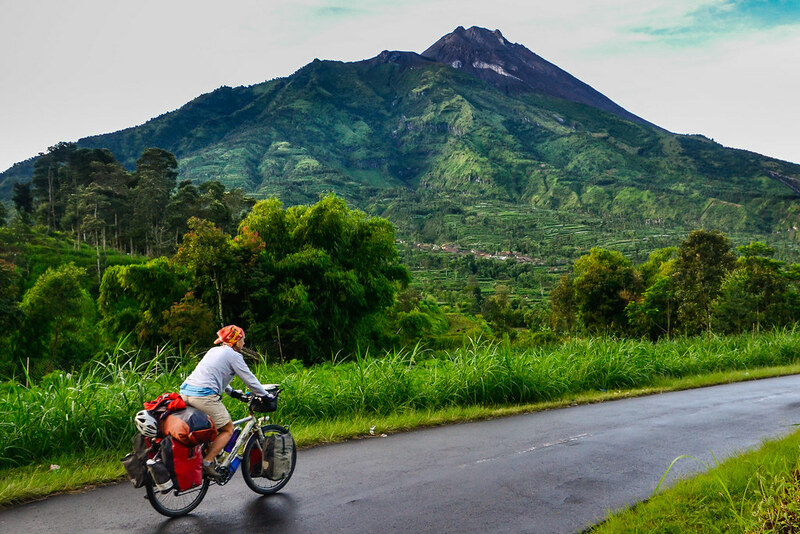 This is another volcano we cycled past, Mount Ciremai in West Java. It’s a striking symmetrical stratovolcano. 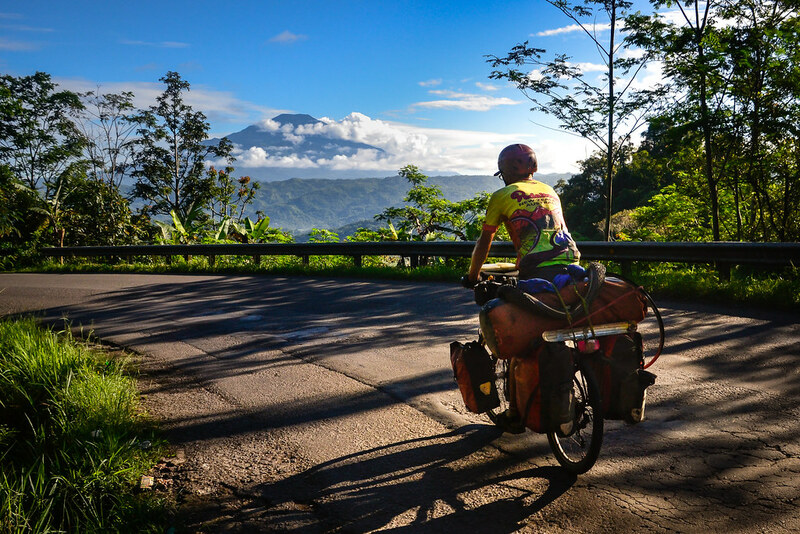 The road climbs to around 1,200 meters, where the air is cool and refreshing. Fabulous views of the volcano as we descend. Java’s got a bad rap amongst cyclists. It’s crowded, its roads are treacherous and people less friendly than those on outlying islands. Your best bet is to whiz through Java and get to the good stuff: Sumatra, if you’re heading north; Bali, for those travelling south. This is all true if you stick to the main roads. By day’s end your head will be throbbing from the cacophony of trucks rumbling by and motorbikes blasting past. But route possibilities are endless on Java. With the help of our GPS, Eric was able to navigate us through some beautiful backroads. 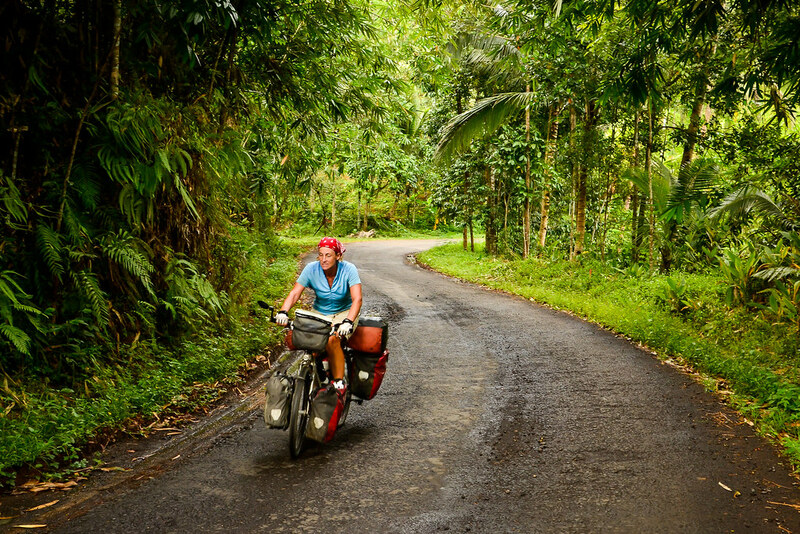 Even on one of the world’s most densely populated islands, you can find roads like this! 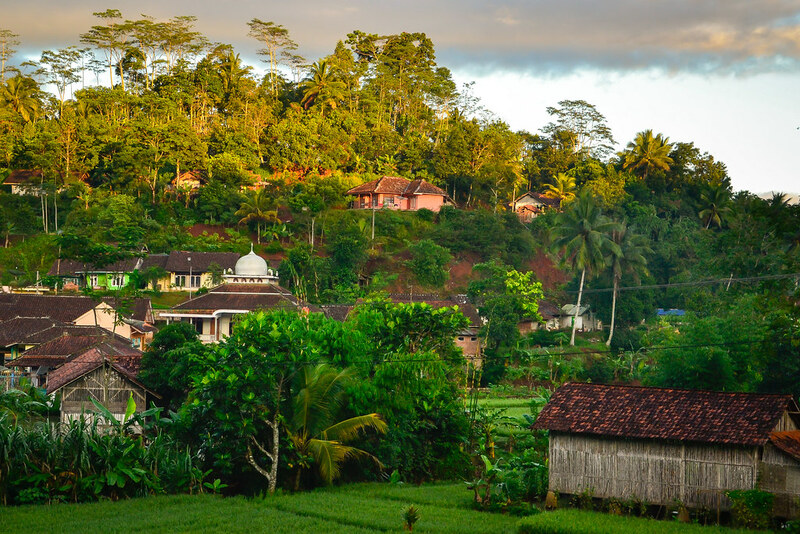 Java’s even got great biking past picturesque villages nestled in the highlands. Of course there are less scenic roads like this one. Luckily there’s usually something interesting going on to distract you from the chaotic traffic. The great thing about Java is that restaurants abound. 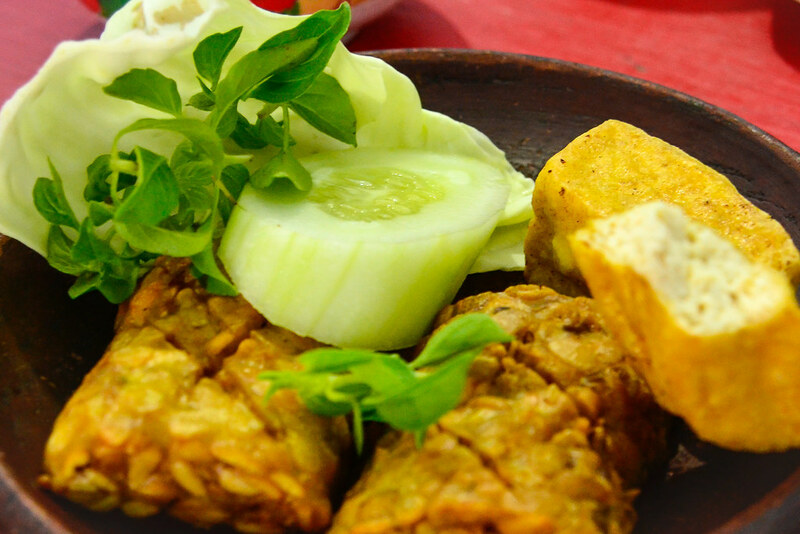 No need to starve yourself on instant noodles or fill up on junk fund for quick energy.. Tempe and tahu are tasty vegetarian options. 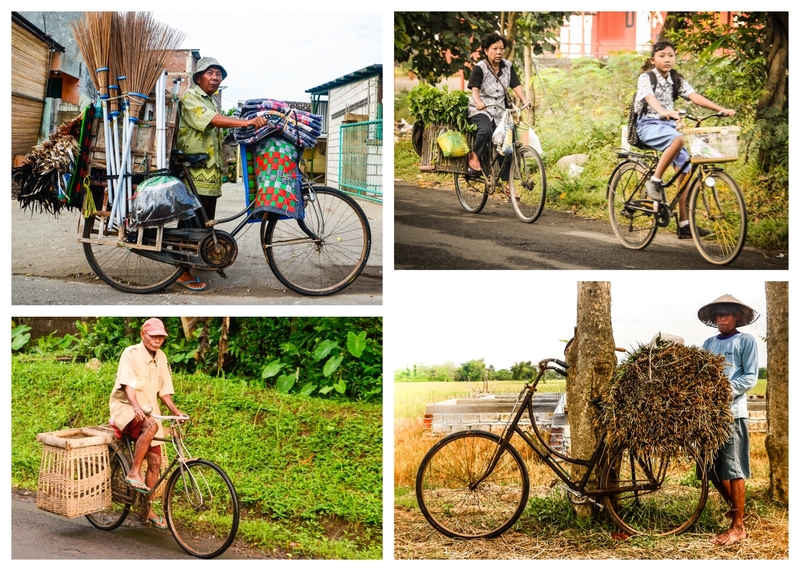 As long as the roads are flat, Indonesians embrace the humble bicycle. Girls and boys in crisp uniforms trundle off to school on two wheels, hard-working villagers balance unbelievably heavy loads on ancient machines and the urban elite fly by on flashy bikes costing the equivalent of several years earnings for their rural neighbors. It’s fun being part of the crowd. We get a few long looks, but nothing like the attention we garnered on Sulawesi. 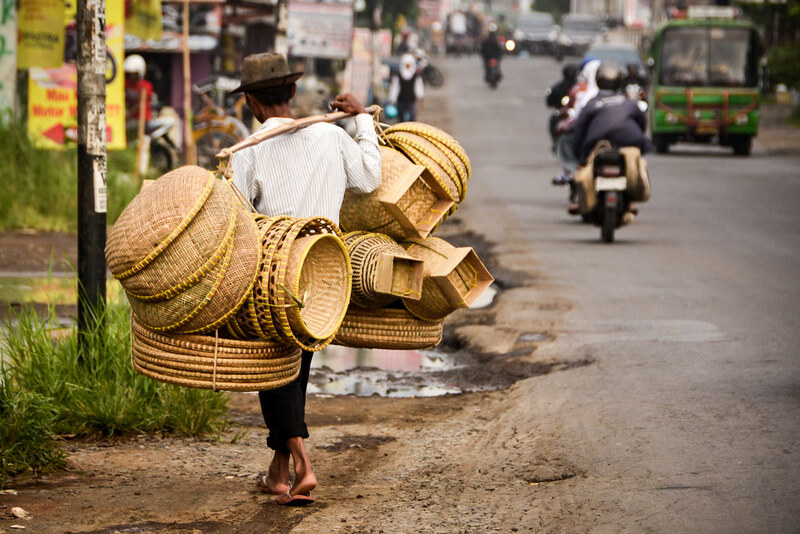 The Javanese are industrious people, with no time to linger by the roadside chatting with foreigners and snapping their photo. Well, at least the biggest cultural tourist attraction. 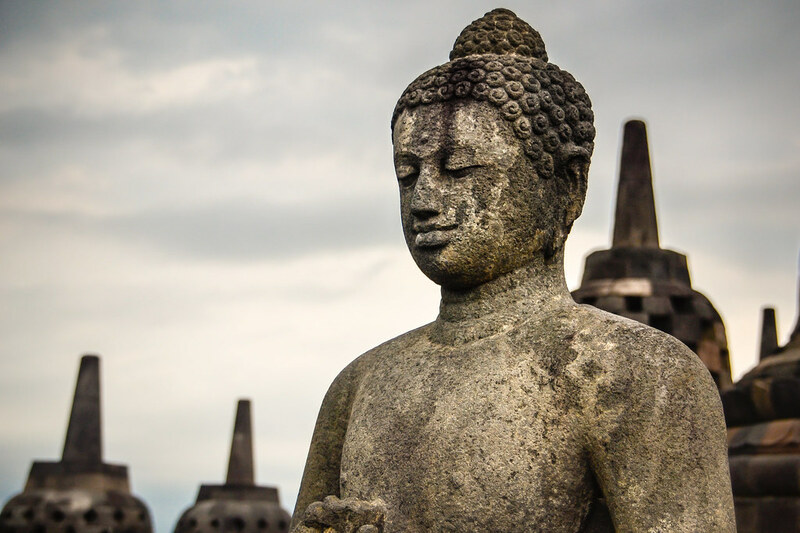 Bali’s beaches are, obviously, far more popular than 9th century Buddhist temples. We’d had our fill of beautiful coastline on Sulawesi so wandering around ancient temples came as a pleasant change. The setting, a meticulously manicured park surrounded by lush tropical countryside and rolling hills, couldn’t be lovelier. This is the single largest Buddhist structure on the entire planet. 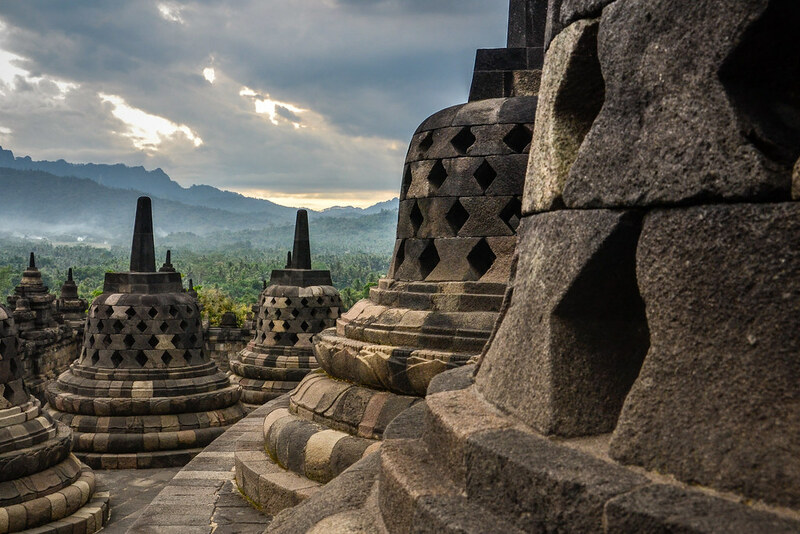 Naturally, Borobudur has been designated a UNESCO World Heritage site. Tourists can climb to the top of the temple and admire the relief work and stuppas up close. It was pretty quiet when we visited, so we could enjoy the views out over the countryside. 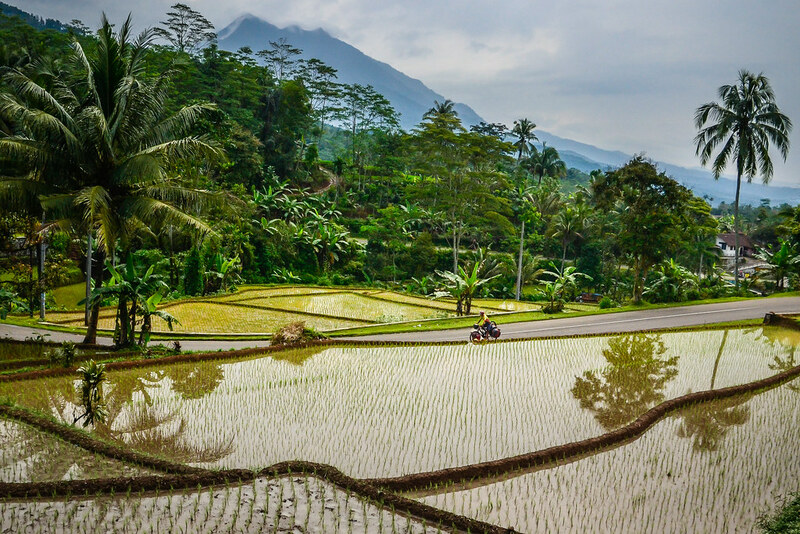 These beautiful terraced rice fields are just a couple day’s ride from Jakarta. Java does offer up some fine cycling, you just have to do a bit of work to discover the hidden gems. 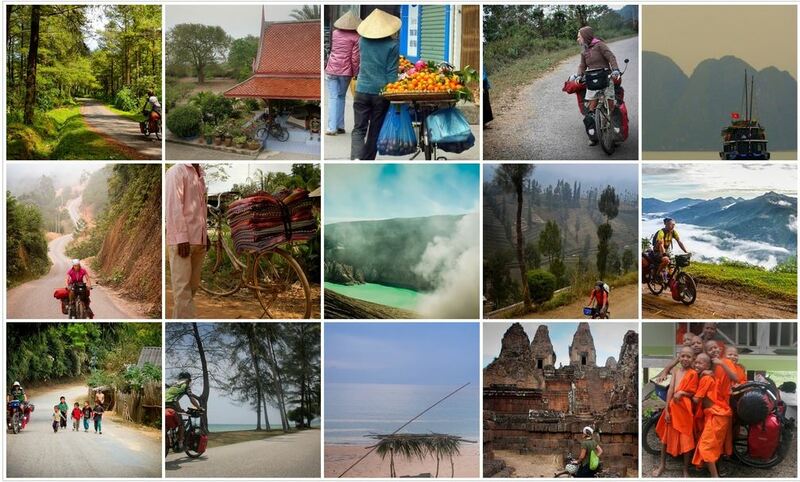 You can see more bicycle touring photos of Java on the World Biking Flickr page. It’s picturesque scenery !!! Wonderfule nature and nice pictures from you ! Enjoy many many things and alwasy be carefule, take care ! that it rains a lot but I would like to hear the opinion of cyclists who have done it already. Thanks!